Providing Colorado Businesses with digital coupon marketing services. 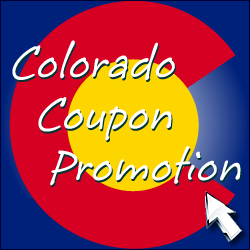 Colorado Promotion provides professional coupon promotions and marketing services for Colorado based businesses, including Restaurants, services based businesses, franchise locations, and more. We advertise your coupon or restaurant deal to a local, targeted area (or areas) of Colorado that your business serves. We view your business coupon ad as an opportunity to help promote the vibrant and wonderful state of Colorado and its inspiring local business communities. Free basic Coupon design and setup. – Colorado Promotion helps you create a coupon design that incorporates your logo, branding, or other images that you wish to advertise with your coupon deal. From integrating an existing print coupon (pdf, images, etc.) to creating a newly designed basic advertisement, we plug your coupon listing into our extensive Colorado advertising network. Add a Coupon today!